Next up in the interview series is C.O. 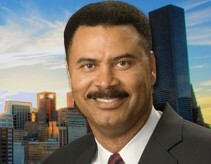 “Brad” Bradford, who is running for At Large #4, currently held by the term-limited Ronald Green. Bradford was the Democratic candidate for Harris County District Attorney last year, and though he lost in a very close race, a number of the ideas he campaigned on have been adopted by the victor, DA Pat Lykos. Bradford is a 30-year resident of Houston who served in HPD for 24 years, including a stint as Chief of Police under former Mayors Bob Lanier and Lee Brown.